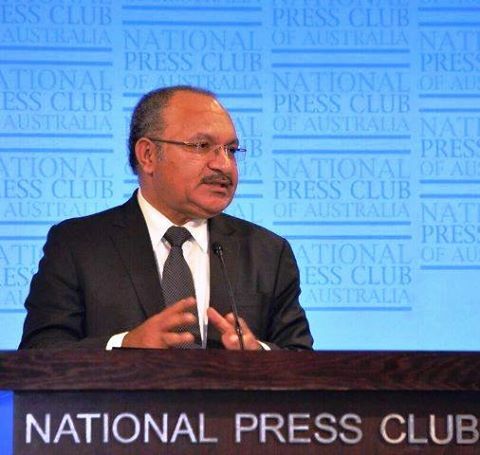 The Papua New Guinea Prime Minister, Peter O’Neill has delivered an address at the National Press Club of Australia at which he highlighted the improvements in the bilateral relationship between Papua New Guinea and Australia. In his address, PM O’Neill also highlighted the way in which both countries have worked together to evolve the way in which development support is provided. “Our Government-to-Government relationship is in a better position, but it is also taking on important new dimensions,” the Prime minister said to the press club audience. Mr O'Neill said both governments have worked together to deliver reforms in the way foreign technical advisers are engaged. “We are starting to reform the way we engage between our two countries, particularly in the engagement of Australians who are working in Papua New Guinea." “Recently, we have restructured the way Australians work in providing technical advice and building technical capacity in our public service and we want the Australians to be a part of our public service machinery, not merely consultants in the system," said Mr O'Neill. The Prime Minister highlighted a positive recent example of an a foreign adviser being engaged to work in the Papua New Guinea public service structure, and he welcomed other advisers with skills to offer and a desire to serve the nation. “Our Cabinet recently appointed an experienced Australian Federal Police Assistant Commissioner, Mr Alan Scott, to be our third Deputy Commissioner for police in Papua New Guinea.He will be sworn in very shortly." O'Neill said that these are the sort of the opportunities that are available for Australians who would want to work and live in Papua New Guinea. “We believe strongly that building capacity and directly being involved in the public service machinery in Papua New Guinea is the way forward for Australia’s contribution in building Papua New Guinea for our citizens,” he said. The issue of foreign technical advisers working directly under Papua New Guinea authority was further highlighted during a bilateral meeting with Australia’s Prime Minister, Hon. Malcolm Turnbull MP, later in the day. The address to the National Press Club of Australia in Canberra, on March 3, was the second by Prime Minister O’Neill having last addressed the media group in 2013.